The Seth Thomas Regulator No. 2 regulator was introduced in the early to mid 1860s and produced until 1950, likely the only clock with such a length of production. Originally selling price is unknown, but by 1873, the price was $16 and when production ended and priced at $110. The timepiece with its 12” dial and long wooden case is handsome on any wall. 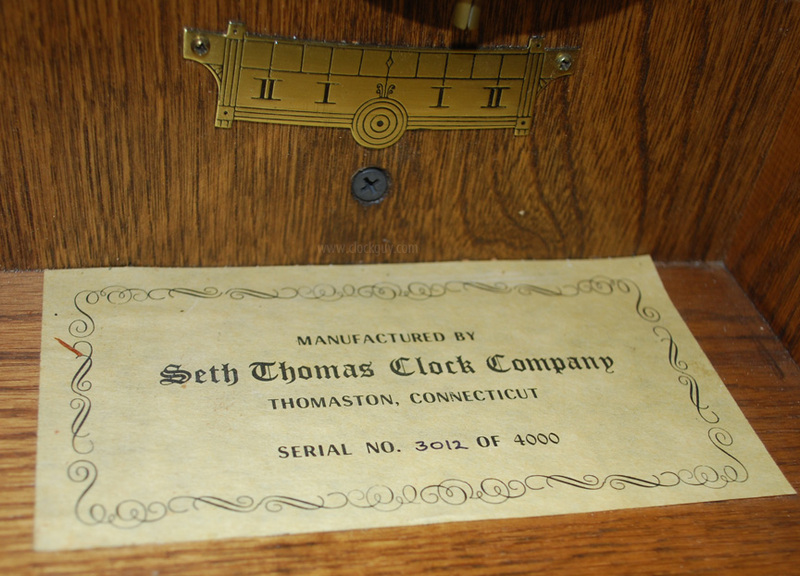 When introduced, the Seth Thomas Regulator No. 2 case was a walnut veneer. Around 1890, cherry, oak, and old oak cases were introduced; with the final wood case available in mahogany and oak around 1913. The overall case length varied between 34 to 36.5 inches depending on the period in which it was manufactured. Dating the manufacturing period can be difficult as there are many characteristics that need to be studied. As mentioned, the available woods changed, as did the construction and style of the base, the tablet, case length, dial and the numeral style, seconds bit, and the hands. Another feature in dating the number 2 is the area directly below the dial and above the lower door and tablet called the “bow tie.” The bow tie can be made up from one to three pieces of wood depending on it age. Some of the later cases have a series of numbers stamped or stenciled on the back of the case and by decoding the numbers, the month and year of manufacture can be determined. Over the life of the regulator, four different Seth Thomas movements were used in the timepiece, the number 61, 77, 77A, and the 77B. Each of the movements had a Graham deadbeat escapement, maintaining power, weight driven, and designed to operate with a 2- pound pendulum on a wooden rod. The Seth number 2 is an accurate timekeeper and the railroad used them in their system showing the correct time to the many travelers passing through the train stations. Many were fitted with a Montgomery (SFRR) dial, that is today is coveted by collectors. The No. 2 was again reissued in 1976 with only four thousand being manufactured. Each had a series-numbered label on the inside bottom of the case. As you can see, this particular clock is number 3012 of 4,000. At this time, Seth Thomas was a division of General Time, a Talley industries company. The reissue model was advertised in the “Mart” publication of the National Association of Watch and Clock Collectors (NAWCC) and has been a popular clock ever since then. Unlike the originals, which had veneered bezels, the reissue features a solid oak bezel. It also utilizes a ST-marked movement copied from the old ST61 rectangular movement.